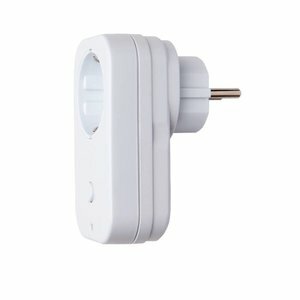 Wireless Power Socket For ESIM364 and EPIR3. EWM1 is a power socket, which lets users to switch on/off and monitor power consumption of any 230V electrical appliance, such as electric heating appliances, lights, air-conditioner, watering equipment and other. By plugging the appliance into the electrical outlet of EWM1, the user gains a possibility to control it by wireless keyfob, keypad, scheduled time or a specific system event. In order to start using EWM1, it has to be paired with ELDES alarm system using Eldes Configuration Tool Software or by sending a corresponding SMS text message to ELDES alarm system. It is possible to connect up to 16 EWM1 devices to PITBULL-ALARM system, while to ESIM364 alarm system – up to 32 EWM1 devices at a time. The maximum wireless connection range is 150m (492.13ft) (in open areas).